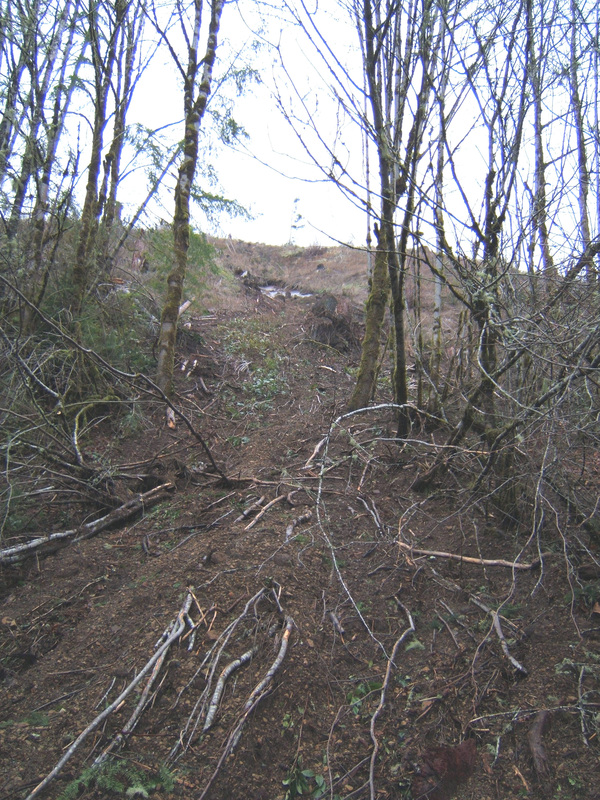 One of the more interesting landslides I have ran across was a debris flow triggered during the December 3rd, 2007 storm west of Pe Ell, Lewis County. Kelsay and I were conducting a reconnaissance of SW Washington to try and find out just how bad the landslides were. We pulled up through Pe Ell to find two debris flows that had come across State Route 7 and surrounded a house. We parked and I decided to hike up the western debris flow as Kelsay went to look at the eastern debris flow. Unfortunately, I didn’t see the ditch that was covered in mud and quickly went up to my hips in mud (and since I do all my field work in a skirt, that was about as awful as it got!). Past falling in the mud, the hike up was fairly easy and the scarp was amazing. A thin layer of soil and dirt has slid off of a hollow area (not to be confused with the DNR Forest Practices definition of a bedrock hollow), that is a volcanic tuff. The soil is between 6 inches and two feet, depending on which side of the scarp you are at. The convergent topography with intense precipitation probably greatly contributed to the landslide moving. The rainfall in this area was probably between 16-20 inches during the storm (the majority falling on December 3rd). 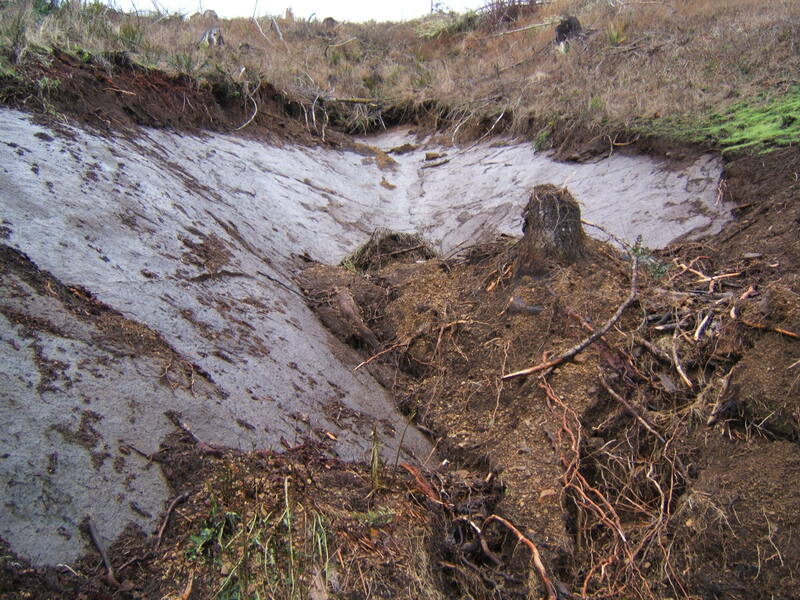 Intense rain + shallow soils + impermeable substrate = landslide. Actually, that is the formula we saw again and again for almost all landslides during the December 3rd storm. The other interesting thing to point out, the area was recently harvested. The lack of canopy coverage can increase the rate that rainfall will reach the ground (from a timed delay to no delay). 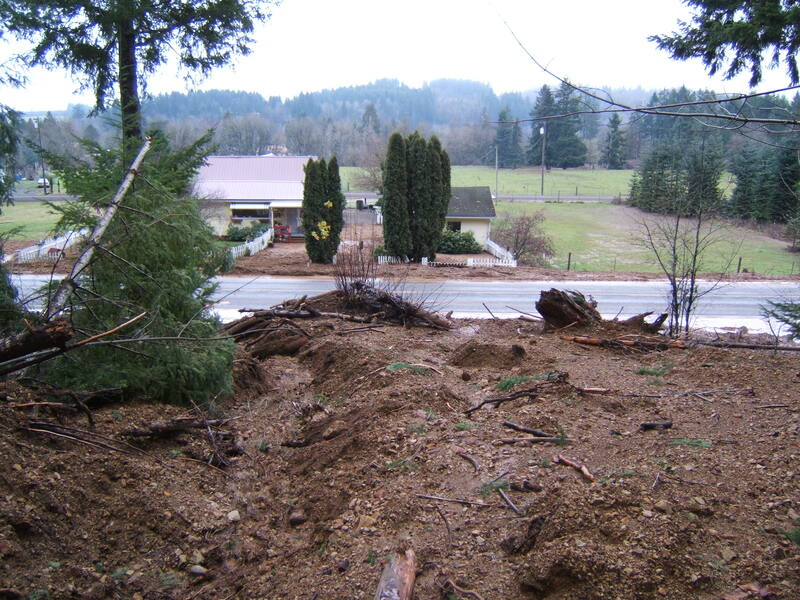 On weak storms and wet winters, this could increase landslide activity, but we haven’t seen it very many compelling cases around Washington State (but there is a nice study from Canada). However, during the December 3rd storm, the intense precipitation and lack of canopy might (and I will go out on a limb and say almost certainly) have increased landslide activity. To what extent and what increase, that remains to be seen.